In California, once couples marry, most property they acquire from that date forward is considered the joint property of both spouses -- commonly referred to as marital property or community property -- regardless of which spouse's name is on the title. However, any property that one spouse acquired before the marriage, or during the marriage by inheritance or gift remains the separate property of that spouse. Debts are treated in the exact same manner. If acquired during the marriage, the debts are considered "community debts" and the joint responsibility of both spouses. Depending on the circumstances, California spouses may choose to file jointly or have only one spouse file for bankruptcy. In a Chapter 7 bankruptcy, a spouse's nonexempt assets are liquidated by a court-appointed trustee to pay the spouse's creditors. If any eligible debts are left unpaid, they are discharged and the spouse is no longer liable for them. In contrast, none of a spouse's assets are handed over in a Chapter 13 bankruptcy; instead, the spouse enters into a repayment plan lasting three to five years. If any eligible debts remain after the plan is completed, they are discharged. When California spouses file for bankruptcy, a bankruptcy estate is created. In a Chapter 7 bankruptcy, debtors are required to hand over all the property they own or have an interest in, although most Chapter 7 filers don't have any eligible assets to give up. This means not only must spouses give up their separate property, but community property as well, even though the other spouse has an equal interest in it. Once this property is placed in the bankruptcy estate, the bankruptcy trustee takes control of it and liquidates the assets to pay creditors. 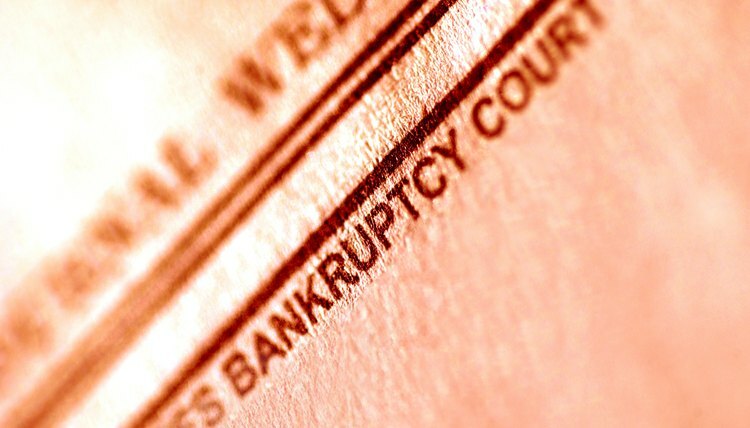 In a Chapter 13 bankruptcy, although assets in the bankruptcy estate are not seized to pay creditors, they are used to calculate the debtor's payments under the repayment plan and include the debtor's income. Even if a joint petition was not filed, the non-filing spouse's income is also included because it is considered a joint asset under community property law. In Chapter 13 bankruptcy, the larger the estate, the higher the payments. Unless a California spouse can find a way to protect his property, both separate and community, it will be placed in the bankruptcy estate and lost to seizure in a Chapter 7 bankruptcy or increase his payment amount under a Chapter 13 repayment plan. One way to protect property is by finding an exemption to cover it in state law -- categories of property a debtor can protect up to a certain dollar amount. For example, a debtor can protect his home up to $75,000 in value, or more depending on the circumstances, under California's homestead exemption. Some states allow debtors to choose between federal and state exemptions. In California, debtors can only use state exemptions; however, they tend to be more generous than federal exemptions. When one spouse files for bankruptcy in California, the other spouse is automatically protected by what's known as a "community discharge." If any community debts were discharged in the filing spouse's bankruptcy, those creditors are barred from then going after the other spouse and her one-half interest in the couple's community property, presently or acquired in the future, including wages, bank accounts and personal property. This protection lasts for the life of the marriage. Unfortunately, the community discharge does not bar creditors from attempting to collect from the non-filing spouse's separate property. Robleto Law: What Is a Bankruptcy Exemption?